On 09 May 2017, I transitioned from being a long-term intern at Red Hat, to being a full-time member of the Fedora Engineering team. In this post, I’ll discuss a bit about what I’ve been working on and how the transition worked. I had been talking with my manager, Paul Frields, for some time about transitioning to full-time after college. Long story short, the timing so happened to work out that I could be brought on slightly before I’m officially done with college. To that end, I am planning to finish college out part-time from here on out. I still have to take an Ethics course to finish my computer science degree, and I still have some math classes left, for my math degree. I plan on going <= 6 credit hours per semester until I am done, however long that takes. When I was brought onboard as an intern back in 2012, I opted out of going to New Hire Orientation (NHO), in the interest of not hvaing to miss classes. However, since the transition to full-time was after the semester, going to NHO was feasible. Paul did some work to make it so that the week of my NHO, a two day series of presentations, was during the same week as the CI and Infrastructure Hackathon which I also attended that week. On Monday and Tuesday (the days of NHO), I went to the hackathon after the NHO presentations were over, to join up with the team. After Tuesday, I stayed with the team for the rest of the week and stayed involved in the hackfest. During the hackfest, I was also given my first official full-time task: Go into the iDRAC of all of our R520 servers, and check for failed drives. I did so, but realizing that this is actually a common task, I made a note to automate this later on, and a few weeks later wrote a script to log into the iDRAC, and check the drive status automatically. I’ll probably write another post about that at some point. Since I didn’t write at all about the hackfest before now, I’ll write briefly about it here. We got a lot done, and ended up getting an OpenShift instance in our staging environment. More information on that can be found on the Fedora Wiki and the Fedora Gobby instance which has a document on it. I also got to talk with Patrick Uiterwijk who briefed me on some of the things within our OpenStack cloud deployment, since that is something I will likely be working on down the road. In between various meetings and talking with people, I was setting up my new loaner laptop with a fresh Fedora 25 install, and getting things roughly configured on it. We did updates/reboots of all of our servers before the Fedora 26 Final infrastructure freeze. Patrick recently showed me the process to do updates on the OpenStack cloud, which went surprisngly smoothly. I’ve been working on an fpaste rewrite. I’ll have another post on this soon. I’m doing it in Haskell for a number of reasons and have been working with the Haskell SIG. The repo is here, but the name will be changed at some point. The iDRAC script mentioned above. Learning about OpenShift, and looking at getting some of our smaller apps running on it for testing purposes. Looking at getting S3 mirroring back up for Fedora repos. Learning how to call in bad hard drives for RMAs/replacements. A lot of other things that I’m forgetting. Five Years or Nine Weeks? I’ve been a full-time employee for about nine weeks now. 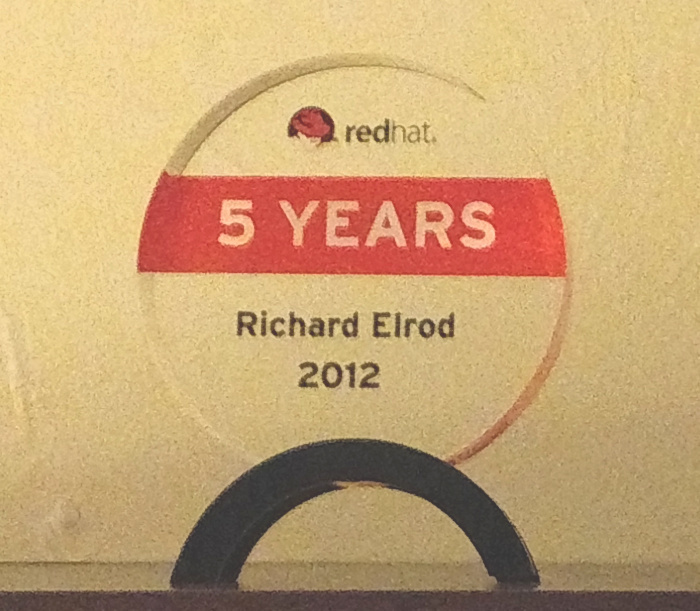 Yet, I recently received my five year service award puck for being with Red Hat for five years. This is because of the long-term internship that I had before I became full-time. Nevertheless, I love the service award puck! I’ll be trying to write more posts about things I’m working on (both in Fedora and not), going forward. Stay tuned!